Situated at the geographical center of the United States, South Dakota is full of spectacular sights. This Great Plains state’s Black Hills, majestic rivers, vast grasslands, and breathtaking badlands have enchanted visitors for hundreds of years. 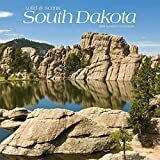 Explore the natural beauty, abundant wildlife, and dramatic national monuments of South Dakota with this beautifully photographed square wall calendar.